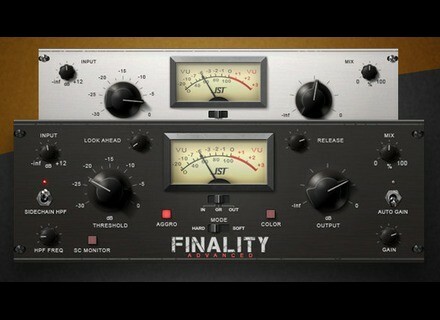 Finality Advanced, Software limiter from JST in the Finality series. A track with too wide a dynamic range can cause problems when mixing. Rather than using automation to smooth out the levels, which is very time consuming, a compressor or limiter can do it for you automatically. 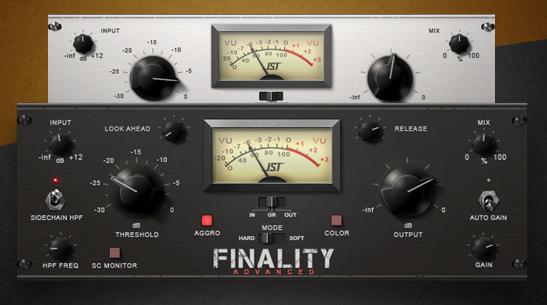 The Finality Advanced limiter plug-in from Joey Sturgis Tones gives you a versatile tool set for taming dynamics, and it adds some pleasing sonic coloration, as well. For those not familiar, Joey Sturgis (read our interview with him) is producer/engineer who works mainly in the alternative metal and rock genres. He also has a plug-in company, Joey Sturgis Tones, that's known for making quality, affordable plug-ins. At a $69 introductory price (eventually going up to $89), Finality Advanced (Mac/PC) offers excellent value. A simpler version, Finality Lite, which features the same engine with less controls is included when you buy Finality Advanced. 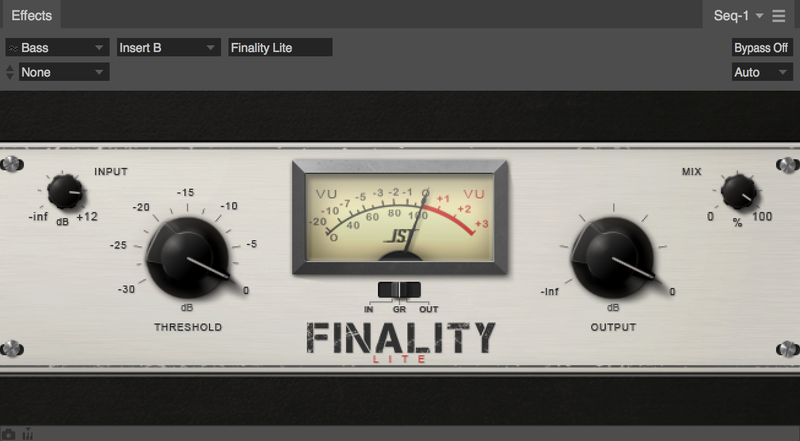 You can also purchase Finality Lite by itself for $39. Finality Advanced is not a brickwall limiter. That is, you can’t use it to completely stop audio from rising above a specified threshold. However, it's very versatile and can be used on everything from vocals to drums to guitars and more. It can also function as a master bus limiter. Finality Advanced offers flexible limiting and sonic coloration. Finality Advanced runs on VST2, VST3, AU, and AAX in 32- or 64-bit format, and as a 32-bit RTAS plug-in (RTAS doesn't support 64-bit). The GUI has an old-school hardware look to it, with a dark face, and a VU-style meter that can be set to show Input, Gain Reduction or Output. Large knobs are provided for Threshold and Output, both of which you’ll end up adjusting quite a bit. Threshold controls how much Limiting is applied to the signal. Output adjusts the level of the signal exiting the plug-in. The Input knob lets you adjust the incoming signal level, and the higher it’s turned up, the more gain reduction you get. I found that only the last quarter or so of the Input knob was usable, however, because once you drop it below about 2 o'clock, it tapers off so steeply that all your level is gone. Gain is a makeup gain control to compensate for loss of level from the limiting. If you turn on the Auto Gain switch, the makeup gain is adjusted automatically. Yet another knob, Mix, is essentially a Wet/Dry control for Finality, giving you the ability to apply parallel compression and dial in precisely the amount of processing you want. There’s no attack control, and the manual doesn’t even mention the word “attack,” so I’m assuming the attack is program dependent. The release is controllable via the Release knob. If you’re trying to reduce the dynamic range of a peaky track, the Lookahead function is designed to allow the limiter to act more quickly on fast transients. It defaults to a 1.0 ms setting, and goes up to 5 ms. Lookahead functions can typically add to CPU usage and latency, but neither of those was particularly noticeable on Finality Advanced. At least in my testing, Finality Lite didn't use appreciably less CPU than Finality Advanced. As a result, I'm not really sure why it's included when you buy the Advanced version. What reason is there to use the Lite version when you can use the full one and it doesn't make much difference CPU-wise? The Aggro feature, which is activated with a little red switch under the left side of the VU, changes the release envelope to be friendlier to drums and other elements with fast transients. A second red button, labeled Color, allows you to switch on a relatively subtle saturation effect. As you lower the Threshold, it increases the amount of saturation. It never gets overly distorted, it just adds pleasing crunch to the signal. You can also switch between two limiting modes, Hard and Soft, which I presume refer to the "knee" setting of the limiter, which governs how abruptly or gradually it acts up on a signal that passes the threshold. Finality Advanced also has a Sidechain function, which consists of a Sidechain HPF (high-pass frequency) on/off switch, a HPF knob, and a Sidechain Monitor button. The Sidechain lets you to exclude a selectable frequency range (via a high-pass filter) from the processing, which can make it possible to target your processing to a particular frequency area. You could use it if, for example, if you were trying to only compress the snare in a mixed drum track, or keep low-frequency information from triggering too much processing (which it can do). Just turn on the Sidechain switch and dial in a filter setting. You can use the Monitor button to listen to the sidechain soloed, so you can hear the signal you’re sending to the limiter. Several features are hidden on Finality Advanced, and if you didn’t read the manual (which is also kind of hidden) you wouldn’t know they exist. If you click on the Finality Advanced logo on the front of the plug-in, you get an “About” screen, which shows, among other info, the version number and format, and has a link for the PDF manual. Anyone using the plug-in for a while will eventually stumble upon the manual link. But I wish the folks at JST would have done what other plug-in developers do, and put a help button on the main panel of the plug-in. If you go on the JST website, you'll find a video manual, which also contians the pertinent information about Finality. Once you do read the manual, you'll discover that there are modifier keys that allow some extra functionality. For instance, double-clicking or right-clicking on a knob opens up a numerical field that you can type a value into. Control (Command on Windows) clicking returns a knob to its default. Shift-clicking gives you finer parameter control, and, if you’re using a VST3 version of Finality, right-clicking opens up an automation menu. Finality Lite, which has a silver face and an LA-2A kind of look to it, is much lighter in the feature department than Finality Advanced. It has Threshold, Output, Input and Mix knobs, as well as the selectable meter modes. For simple limiting tasks, such as smoothing out the dynamics in a vocal or an instrument part, it works fine. The weird part is that it doesn’t appear to use significantly less CPU, so unless you’re buying it instead of the Advanced version, I don’t see a lot of reason to use it. I used Finality Advanced on multitrack drums, both live-recorded and MIDI. I found that it almost always helped fatten up the sound. In the next few examples, the first time a section plays, the plug-in is bypassed. Then, after a very brief pause it repeats, this time with the plug-in on. I also used it on electric bass, and it both smoothed the dynamics a bit and fattened the tone a bit. Here’s the bass, first without, then with. 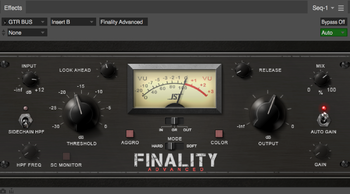 I also tried Finality Advanced out on vocals, and it worked well for narrowing the dynamic range. On acoustic instruments, I found it useful for not only dynamic smoothing, but also for adding a little bit of heft to the tone. I also liked it as a master bus limiter — it provided some glue to the mix and additional volume if I wanted. Although it won't replace my UAD SSL Channel G Bus Compressor plug-in, it does a nice job as a bus limiter. 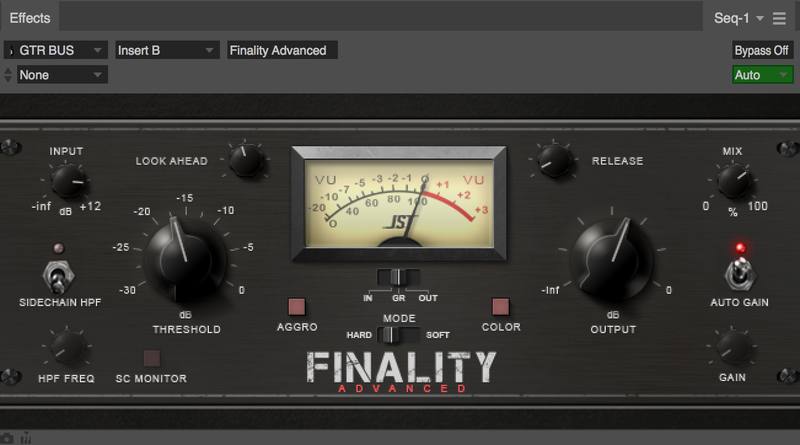 Finality Advanced ($69) is a very handy plug-in, and gives you excellent quality and features for an extremely reasonable price. Its flexible feature set makes it useful on all types of sources including vocals and instruments, it and gives you a lot of control. If you’re looking for a limiter to help smooth the dynamics of your mixes, and to add nice coloration as well, Finality Advanced is an excellent choice, and a great value.